Name the Painting Contest – This Time it’s Tom Waits! The painting has been named!!! [CLICK HERE] for the winning announcement! 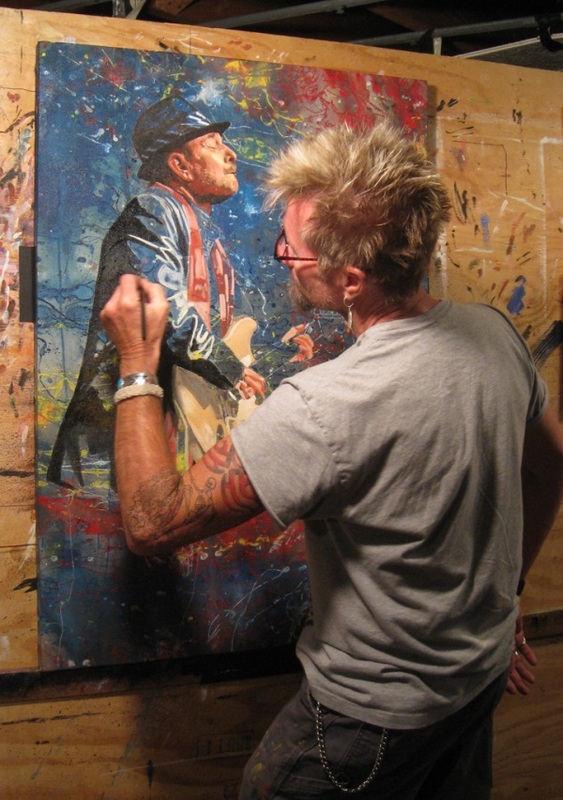 After the overwhelming response to the previous “Name the Painting” contests for Gary Moore, Joe Bonamassa, Buddy Guy, Roy Buchanan and Billy Gibbons, Ronnie Earl, my good friend and world-renowned artist Tom Noll is back at it again with the legendary Tom Waits on his canvas! With this trademark growl, his incorporation of pre-rock music styles such as blues and jazz, and experimental tendencies verging on industrial music, Waits has built up a distinctive musical persona. He has worked as a composer for movies and musical plays and has acted in supporting roles in films including Paradise Alley and Bram Stoker’s Dracula. He has a cult following and has influenced subsequent songwriters despite having little radio or music video support. His songs are best-known through cover versions by more commercial artists: “Jersey Girl”, performed by Bruce Springsteen, “Ol’ ’55”, performed by the Eagles, and “Downtown Train”, performed by Rod Stewart. Although Waits’ albums have met with mixed commercial success in the USA, they have occasionally achieved gold album sales status in other countries. He was nominated for an Academy Award for his soundtrack work on One from the Heart. In 2011, Waits was inducted into the Rock and Roll Hall of Fame. Tom estimates the Tom Waits painting will take several weeks to come together (progress shots will be posted on his web site – CLICK HERE), with prints of the original oil painting available shortly after. The artprints are super high quality giclees, which utilize fade resistant UV archival inks. They’re produced from the original oil painting, and are rolled and shipped in a rigid tube along with a certificate of authenticity. The prints are perfect for matting and framing, and will be a memorable addition to any room. The 27″x19″ prints will be available in mid to late August with a special PRE-ORDER price of $229.00 (plus $8.00 to ship within the USA; $12.50 internationally). As a BONUS, Tom will include a FREE inkjet of the sketch along with the full print! Take a look at the “Creative Bone ArtWorks” Official Web Site and browse Tom’s extensive gallery of “Art That Rocks” which includes many guitar players like Eric Clapton, Carlos Santana, Jeff Beck, Muddy Waters, Keith Richards, David Gilmour, B.B. King, Bruce Springsteen, Dave Matthews, Jimi Hendrix, Stevie Ray Vaughan, Les Paul, Johnny Cash, Gary Moore, Buddy Guy, Joe Bonamassa, Roy Buchanan, Billy Gibbons and Ronnie Earl. There you will find information about pricing, sizes and other info on Tom’s creative artwork. 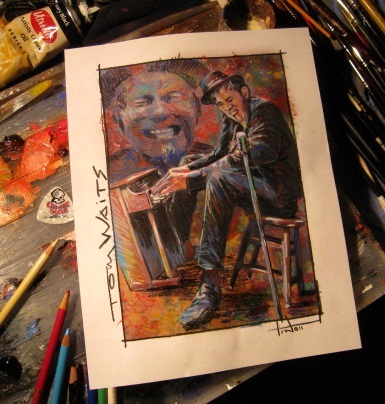 GuitarDaddy Tip: You can Pre-Order a Tom Waits print by contacting Tom directly. Pre-ordering will allow you to reserve a low-numbered print and to receive your print much faster. ALL YOU HAVE TO DO TO ENTER THIS CONTEST IS LEAVE A COMMENT TO THIS POST WITH YOUR SUGGESTION FOR A NAME OF THE TOM WAITS PAINTING! Also, keep checking back to TheGuitarBuzz.com for contest updates! After receiving over 80 name suggestions, Tom Noll has selected the WINNING NAME in the “Name The Gary Moore Painting Contest“. A big THANK YOU to all of you and your heartfelt suggestions that came through while I was swinging the brush…bringing Gary to life on my canvas. Wow…talk about making a naming task “tougher”. I’ve wrestled with a number of these great ideas along the way. The original requests for a Gary Moore painting came from a few different clients of mine in the UK a couple of years ago. I was saddened to learn of his death in February and decided I’d waited too long already to paint him. I feel this portrayal of Gary just nailed his emotion and I thoroughly enjoyed creating it for his followers. I’ve been a giant fan of his soaring blues, and when I saw this title for the painting, it just grabbed me and I felt it was fitting. It speaks instantly of his heritage, and I think Gary would be proud to hang on your wall with this tag. 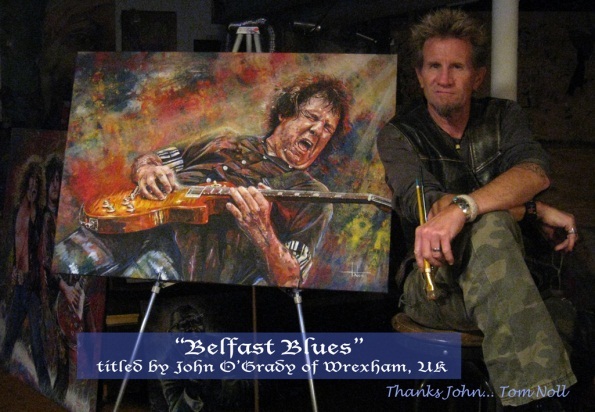 Congrats to John O’Grady of Wrexham UK for the “Belfast Blues”. I’ll be shipping John’s print across the big pond this weekend, back to Gary’s homeland. The 27″ x 19″ prints at that intro price of $217 are in the works and will start shipping this Saturday. For those of you who haven’t reserved one yet, contact me (tom@tomnoll.com) and I’ll arrange to get one coming your way too. Gary Moore: NAME THE PAINTING Contest! 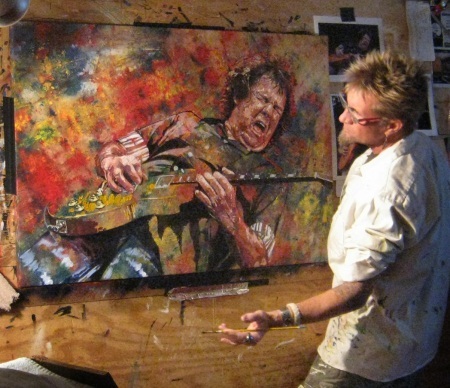 Last week, I posted: Tom Noll Soon to Release Painting of the Late Gary Moore PLUS Live at Montreaux CD and DVD Give Away Contest! The response has been fantastic with comments coming in from readers all around the globe who were influenced by Gary’s Music. And after all…what guitar player would not want to win a Gary Moore CD or DVD? 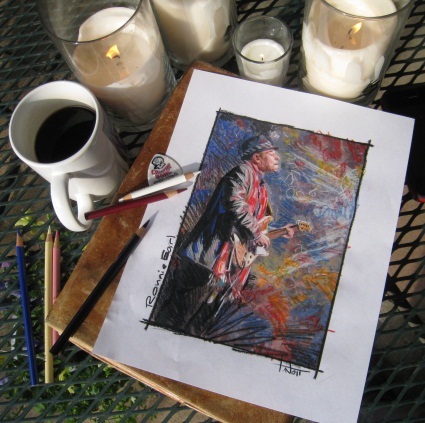 As a part of the CD/DVD giveaway contest, I updated everyone about my favorite artist Tom Noll and his latest project – a hand painted scene of Gary Moore playing guitar live. Well, Tom heard about the post and contacted me with an idea for a 2nd contest and a chance to WIN A FREE PRINT of his completed painting! Tom has an idea in his head for a name of this painting but he would also like to open this up to Gary Moore’s fans and let them suggest a name to the painting! The contest is simple, if Tom selects your suggestion as the final name for the painting, you will receive a FREE PRINT (Tom sells these for over $200.00+ on his web site). All I can say to that is WOW! THANK YOU TOM! Over the past week, Tom and I have exchanged several emails about the Gary Moore project. Here are a few excerpts that will give you a greater understanding about Tom Noll, the artist. I have had numerous requests over the last few years, mostly from my UK clients, as to when I was going to do a GM painting. When I recently watched a YouTube vid of him doing Jimi’s Red House, I realized that from that clip alone, I’d seen dozens of inspirational images that would be perfect for a painting. After careful consideration, I have chosen an image from a concert in Austria, provided to me by Rene Huemer of Austria for the painted piece. The energy of my style and Gary’s expressiveness when performing are a perfect match. In addition to his euphoric look, I’m excited to paint the legendary Peter Greene GoldTop that he is doing his thing on. As I’m painting Gary, I’m reminded of all the people that he’s influenced, and I’m feeling an enormous obligation to capture the Gary we knew and loved, and bring forth his passion. I’d like to extend to his fans, the opportunity to name this painting. I’m offering one of my signed limited edition prints to the person that gets my attention and nails it. It’s really exciting involving his passionate fans. I think that the name should speak of the late Gary’s passion, his energy and fury, his soulfulness, and/or his GoldTop. As a default, I probably would have named it “Rock In Peace”. Ultimately, from the suggestions provided, I’ll pick the name that will live with the painting for the future. Fans can see the painting’s progression on my link, and they should realize that their suggestions are being mulled over by myself, the artist, as the painting is progressing. I’ll pick a name when the painting is completed. `The giclee prints will be 27″ x 19″ and will be released at an introductory price of $217, with $8 to ship within the US, and $12.50 for international. The proposed completion date is mid to late December. You can reserve your low number Gary Moore print by visiting my site and contacting me via email to get on the list. No money’s due until they are ready to ship. I look forward to hearing from The Guitar Buzz followers on this exciting piece. ALL YOU HAVE TO DO TO ENTER THIS CONTEST IS LEAVE A COMMENT TO THIS POST WITH YOUR SUGGESTION FOR A NAME OF THE GARY MOORE PAINTING! *** UPDATE *** The Contest Ends on Tuesday! [CLICK HERE] For Details!! WE HAVE A WINNER in the “Name The Joe Walsh Painting” Contest! I’d like to thank everybody who took the time thinking about my painting, and submitting possible titles. A lot of good ideas came my way from around the globe. And thanks to the GuitarBuzz for hosting & monitoring this event. One name in particular hit home with me, as it not only described Joe’s playing as I’ve portrayed him in the painting, but also, it described me doing the painting. That name, and the winner, is “In the Zone”, submitted by Diane Blue of Boston, MA, USA. Diane will be receiving print number 2/250 next week when they start shipping. 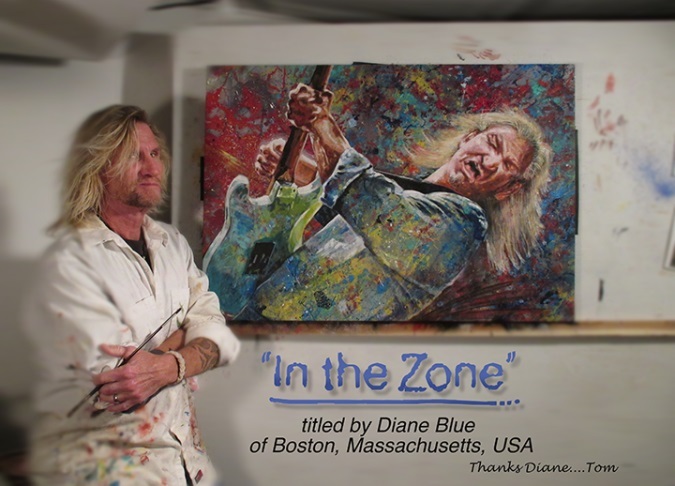 After making this title decision, and looking up Diane for the contact information, it appears Diane knows all about being “In the Zone” as she’s a fellow musician. Nice call!! Thanks to all of you that pre-ordered prints during this contest. For others of you that would like to purchase a print, as of this moment, there are still a few single digit prints available. Contact me and I’ll hook you up. Until next time, keep on rocking!! 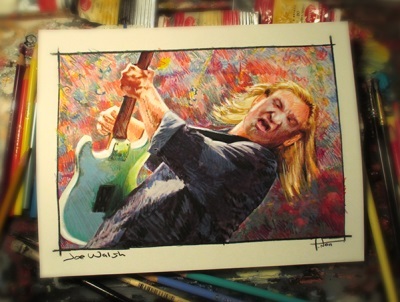 CONTEST: Name This Joe Walsh Painting to WIN A FREE ART PRINT! CONTEST OVER – WINNER ANNOUNCED! 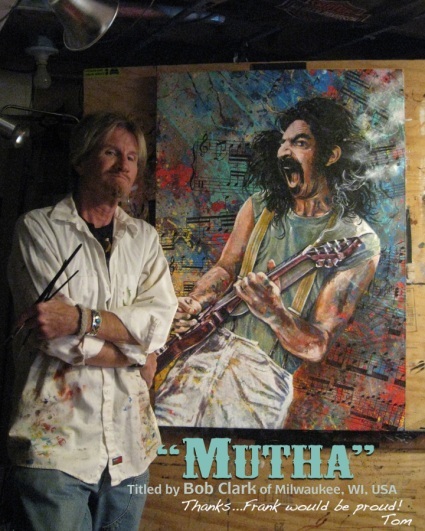 Artist Tom Noll has been honing his talent for years in preparation for this masterpiece of the legendary Joe Walsh. Tom says “I am super excited about this project as I’ve followed Joe since his early days. I remember listening to the James Gang back in high school art class, and thinking then, that it would be cool to do a painting of Joe. That was a long time ago…so its well overdue. What a great way to kick off 2014”. Now, with close to 60 musicians immortalized on canvas, and an international art reputation as the Rock n’ Roll portrait artist, Tom is ready to sink his teeth into this project! Joe Walsh is a classic American musician who has been a member of three commercially successful bands: the James Gang, Barnstorm, and the Eagles, and holds the number 54 spot in Rolling Stone magazine’s “100 Greatest Guitarists of All Time. Besides being an incredible talent, Joe has a way of poking fun at himself and life’s situations, and his wit is infectious. As his popular song portrays, “Ordinary Average Guy”, Joe is genuinely likable and people can relate to him like a good friend who’s there when you need a lift & a smile. This new Joe canvas is coming to life, and Tom is ready to share it with a little creative challenge for you! “I need a steller name for this painting…something other than just a song title, so I’d like to see your imaginative ideas here on the GuitarBuzz. I’ll pick the name from those submitted, and the person who nails it, will be rewarded with a complimentary limited edition print. You can follow the painting progress on my website for inspiration by CLICKING HERE. I’m looking for delivery of prints in late January 2014, so let’s wrap this contest up at midnight Friday, January 17th. I’ll pick a name and announce it Saturday, the next day. The limited edition (250) print reproductions will be produced with an image area of 27″ x 19″ (48.3 cm x 68.6 cm), and introduced for a short time at $259, plus shipping of $8.95 US and $16.50 International. To reserve your low numbered print, CONTACT TOM at Tom@TomNoll.com and he will secure your spot with your email. If you’d like to prepay, he will offer an additional $10 savings with a price of $249. Just let him know, and he’ll send a paypal invoice to your email. Print Specs: The 27″ x 19″ artprints are super high quality giclees, which utilize fade resistant UV archival inks. They’re produced from the original oil painting, and are rolled and shipped in a rigid tube along with a certificate of authenticity. The prints are perfect for matting and framing, and will be a cool addition to any room. For a view of other available art prints by Tom, visit his website by CLICKING HERE. 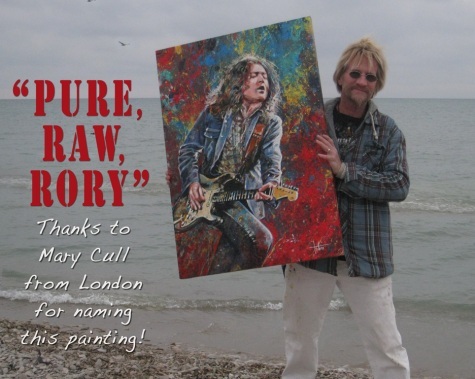 The Rory Gallagher Painting Gets a Name! A complimentary print will be headed across the pond to Mary for this tribute. The limited edition of 250 prints is in progress and slated for shipping this coming week, well in time for Christmas. “Pure, Raw, Rory”…I think he’d agree! ENTRIES WILL BE ACCEPTED THROUGH FRIDAY, DECEMBER 7TH AT MIDNIGHT! After the overwhelming response to the previous “Name the Painting” contests for Gary Moore, Joe Bonamassa, Buddy Guy, Roy Buchanan, Ronnie Earl and Billy Gibbons, my good friend and world-renowned artist Tom Noll is back at it again with Irish blues-rock guitar legend Rory Gallagher on his canvas! Rory’s influence spread through the generations – from Slash to Johnny Marr, from U2’s The Edge to Queen’s Brian May, and onto The Manics’ James Dean Bradfield – any aspiring player who encountered him was bound to be energized or transformed. In 2010, Gallagher was ranked #42 on Gibson.com’s List of their Top 50 Guitarists of All Time. Gallagher was also listed on Rolling Stone magazine’s list of the 100 Greatest Guitarists of All Time, ranked at 57th place. …to which he replied: “I dont know you’d have to ask Rory Gallagher that question”. Here is the “sketch” that Tom Noll created which captures the emotion of Rory’s music and is the inspiration for Tom’s newest painting! Tom estimates the Rory Gallagher painting will take another 1-2 weeks to complete (progress shots will be posted on his web site – CLICK HERE), with prints of the original oil painting available … IN TIME FOR CHRISTMAS!! Take a look at the “Creative Bone ArtWorks” Official Web Site and browse Tom’s extensive gallery of “Art That Rocks” which includes many guitar players like Eric Clapton, Carlos Santana, Jeff Beck, Muddy Waters, Keith Richards, David Gilmour, B.B. King, Bruce Springsteen, Dave Matthews, Jimi Hendrix, Stevie Ray Vaughan, Les Paul, Johnny Cash, Gary Moore, Buddy Guy, Joe Bonamassa, Roy Buchanan, Frank Zappa, Tom Waits and Billy Gibbons. There you will find information about pricing, sizes and other info on Tom’s creative artwork. 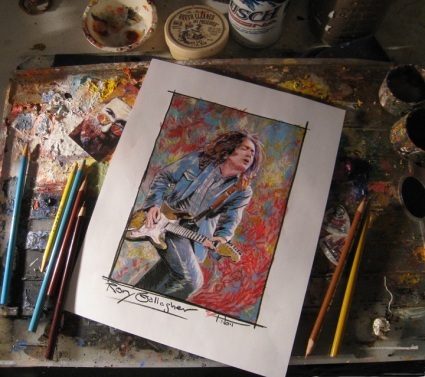 GuitarDaddy Tip: Pre-Order your Rory Gallagher print by contacting Tom directly. Pre-ordering will allow you to reserve a low-numbered print and to receive your print much faster. ALL YOU HAVE TO DO TO ENTER THIS CONTEST IS LEAVE A COMMENT TO THIS POST WITH YOUR SUGGESTION FOR A NAME OF THE RORY GALLAGHER PAINTING! ANOTHER TIP: Be Creative! Don’t just suggest the name of one of Rory’s songs… try to capture the spirit of the image! After over 250+ suggestions, Tom Noll has selected a title for the Ronnie Earl painting! I’ve finished the Ronnie Earl painting and selected the perfect title. But first, I’d like to thank everybody that has been a part of this painting experience. Great inspiration has come from reading not only your title submissions, but all your comments from the heart. So many people opened up to say how much Ronnie Earl means in their life. It really meant a lot to me and made me realize this was bigger than I originally thought, and much more than just another painting. You would think it would have been a lot of pressure, but the energy just flowed out. 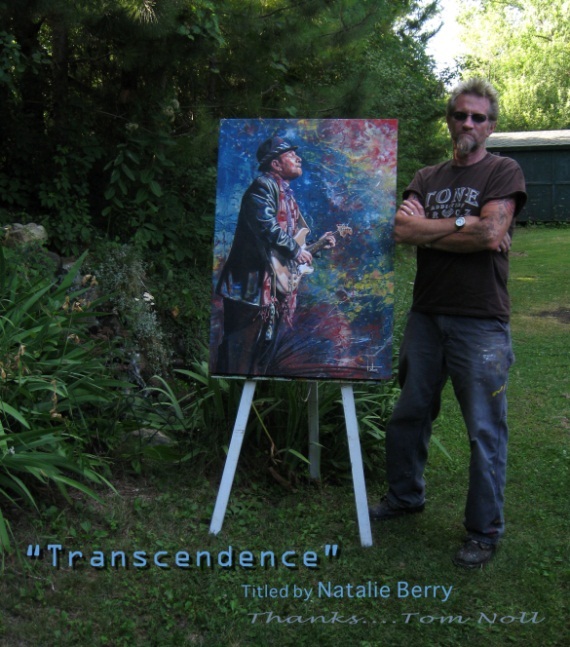 So, if a painting could have dozens of names, this would be it, but I’ve chosen the name: “Transcendence”. I feel that this name captures what Ronnie is about, and what his fans embrace. I truly hope Ronnie will give it the nod. Natalie will be receiving a complimentary print from the limited-edition run as promised! I suspect I will have prints in hand in a couple weeks to start delivering. Pre-orders on these 19” x 27” print are suggested to secure your low numbers of the run of 500. Send an email to me at Tom@TomNoll.com and I will hook you up at the introductory price of $229 and $8 to ship ($12.50 international). I’m honoring this price until July 20th. Thanks again… and feel free to pass this along to all your Ronnie Earl friends! Here We Go Again! Name the “Ronnie Earl Painting” Contest! After the overwhelming response to the previous “Name the Painting” contests for Gary Moore, Joe Bonamassa, Buddy Guy, Roy Buchanan and Billy Gibbons, my good friend and world-renowned artist Tom Noll is back at it again with blues guitar legend Ronnie Earl on his canvas! Regular readers of TheGuitarBuzz know that I am a huge fan of Ronnie Earl! Let’s just say I already have a spot on the wall reserved for this one! Ronnie Earl picked up his first guitar the age of 20. He became serious about the blues after attending a Muddy Waters concert at the Jazz Workshop, a small club in Boston. By his third year in college, Ronnie was seriously pursuing his guitar playing and would go on for the next 39 years to stretch the boundaries of electric blues guitar. In 1979, Ronnie Earl joined the Roomful of Blues, then a ten-piece ensemble group based in Providence, Rhode Island, where he would spend the next eight years playing and touring while releasing a number of albums. In 1988 Ronnie formed his own band that he called The Broadcasters, named after the first Fender guitar which originally had been labeled The Broadcaster and was distributed in 1950. Ronnie musical influences are blues guitarist and vocalist Otis Rush as well as Magic Sam, Guitar Slim, Jimmy McGriff, Jimmy Smith, Grant Green, Thelonious Monk, John Coltrane and Wes Montgomery, all of whom have deeply and profoundly shaped and inspired his playing. Ronnie Earl is a two-time (1997, 1999) W.C. Handy Blues Award winner as Guitar Player of the Year. He has served as an Associate Professor of Guitar at Berklee College of Music, taught for five years at the National Guitar summer workshop in Connecticut. In 1995 Ronnie released Ronnie Earl: Blues Guitar with Soul, an instructional VHS tape that was then re-released in DVD format in 2005. Ronnie’s road manager, Tom Hazeltine, is a talented photographer and has captured hundreds shots of Ronnie playing live. You can find many of them on Ronnie’s Official Website and Tom’s Facebook Page. Here is a “sketch” that Tom Noll made from one of my favorite photographs, which captures the pure emotion of Ronnie’s music and is the inspiration for Tom’s newest painting! Tom estimates the Ronnie Earl painting will take several weeks to come together (progress shots will be posted on his web site – CLICK HERE), with prints of the original oil painting available shortly after. Take a look at the “Creative Bone ArtWorks” Official Web Site and browse Tom’s extensive gallery of “Art That Rocks” which includes many guitar players like Eric Clapton, Carlos Santana, Jeff Beck, Muddy Waters, Keith Richards, David Gilmour, B.B. King, Bruce Springsteen, Dave Matthews, Jimi Hendrix, Stevie Ray Vaughan, Les Paul, Johnny Cash, Gary Moore, Buddy Guy, Joe Bonamassa, Roy Buchanan and Billy Gibbons. There you will find information about pricing, sizes and other info on Tom’s creative artwork. 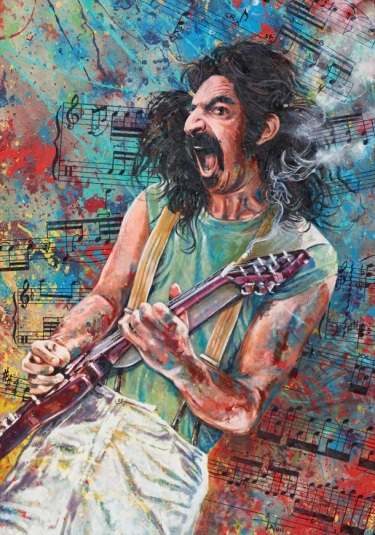 GuitarDaddy Tip: You can Pre-Order a Ronnie Earl print by contacting Tom directly. Pre-ordering will allow you to reserve a low-numbered print and to receive your print much faster.